Welcome to the first edition of the Tulsa Oilers Mailbag! This is a new feature we’re rolling out every other Tuesday, where I’ll do my best to answer all the pressing questions you have about Tulsa’s hockey team. These can be questions related to the 2018-19 roster, past players, the upcoming season’s schedule, team events, and even “non-hockey” related questions that you find important during the long summer months. To avoid confusion, the Mailbag is intended to be both fun and informative, and I’m excited to hear what’s on your mind! If you don’t see your question, it’s not that it wasn’t a good one (there’s no such thing as a dumb question, right?). It may just be that the question was better suited for a different forum (please send all complaints to Oilers’ color-commentator Zack Reynolds). Kidding. You can submit your questions for the next Tulsa Oilers Mailbag by messaging us on Facebook, on Twitter @tulsa_oilers, or sending an email to john@tulsaoilers.com. Without further ado, here we go! Enjoy! JP: I don’t think there’s a “perfect formula” to win a championship at this level, but the teams who are successful (Colorado the last two seasons, for instance) start with a strong leadership group on the ice. Expect a good group of veteran leaders again this year. Coach Murray has always valued team speed, and it’s important to have a healthy balance of size/toughness as well. A good affiliation, like I believe we have with the Blues, will only help us as the season goes along. I’ll ask him this question on our next “Oil Filter” podcast as well. JP: There are less variables in place now with a more structured partnership from the top down. Now that the Blues have a primary AHL affiliate in San Antonio, they’ll have most of their prospects in one location. For instance, St. Louis has 29 forwards under contract (not including players signed to AHL contracts in San Antonio.) Hypothetically, let’s say that number reaches 34 when you include players under AHL contracts. NHL teams typically only carry, at most, 14 forwards at any given time. AHL teams may carry 15 or 16. That would leave four or five forwards who could be assigned to the Oilers. The same goes for defensemen and goalies (St. Louis has six goalies under contract). NHL and AHL teams usually only carry two goalies at a time. That could really strengthen the Oilers’ roster. 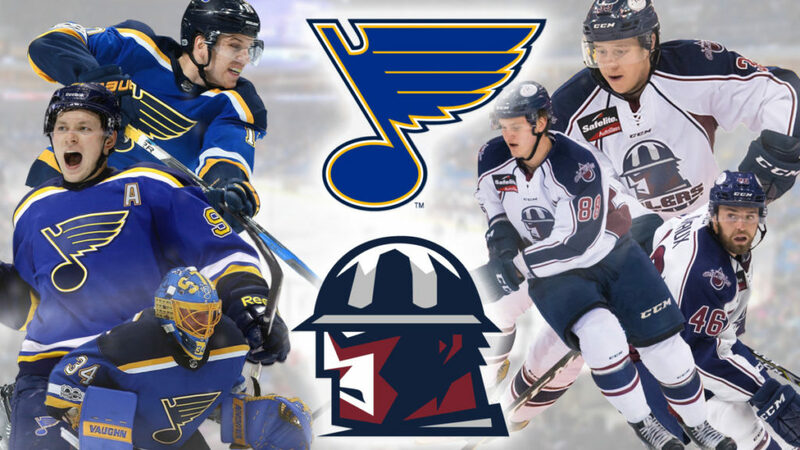 JP: Prior to the Blues affiliation, San Antonio was the primary affiliate of the NHL’s Colorado Avalanche and ECHL’s Colorado Eagles. Now that the Eagles have moved up to the AHL as the Avs’ affiliate, all of the Avalanche prospects still under contract will be with the Eagles in the AHL (or their new ECHL affiliate, Utah). The players who were under ECHL contracts with the Eagles last season are essentially free agents and can sign anywhere. The handful of Blues prospects who were in San Antonio last year (Conner Bleackley, for example), will be in San Antonio again or in Tulsa if they don’t make the Blues roster. JP: Training camp starts the first week in October and runs up until the first game (Saturday, October 13 vs Idaho). In the past, camp has been at the Oilers Ice Center off of Mingo Ave., and all practices and scrimmages at the O.I.C are open to the public. When we get a little closer, we’ll announce a complete Training Camp schedule and roster. Our promotional schedule is still being worked on, but stay tuned later in the summer when we unveil it and some of the cool new theme nights we’re having at the BOK Center. There are strict rules that prevent us from selling NHL/Blues merchandise at our games (pretty standard), as those teams hold the rights to their logos and fan gear. The best way to purchase Blues gear is through their Team Store. And I’ll ask coach that last question in our next podcast! JP: This happens quite often, actually, whether the listener notices or not. It’s frustrating, because you’re worried you might start coughing or have your voice give out in the middle of the action. But I make sure to always have at least two bottles of water and/or a coffee, tea or soda by me at all times in case I have to fight through something like that. JP: I think you have us confused with the Tulsa Oilers baseball team that played in town off and on from 1905-1976. Yes, there was a Tulsa Oilers hockey team and a Tulsa Oilers baseball team at the same time throughout periods of the ’30s-70s. But to answer your question, Pepper Martin left the Tulsa Oilers baseball team in the late 1950s and was posthumously inducted into the Oklahoma Sports Hall of Fame in 1992. JP: This has been one of our most popular promotions the past few years. Here’s a photo below, for those who aren’t familiar. 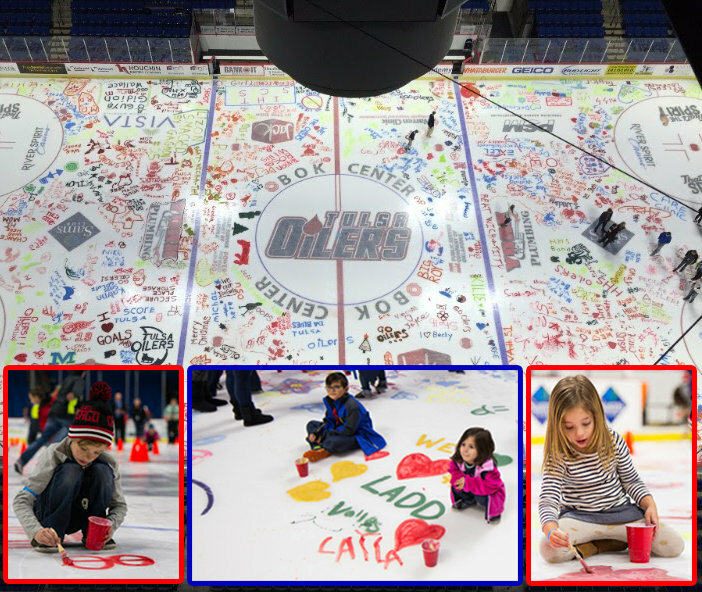 It’s a great event for families around the Holidays, and a fun and unique way for adults and kids alike to show off their artistic ability on the ice that the Oilers players will skate on in a game that week. Sure, it can be a little bit difficult to track the puck at times (trust me, as a broadcaster on the third level, I know), but it just adds to the fun! JP: These are some of the awesome experiences that come with setting up a group outing with the Tulsa Oilers. With 36 home games each year, we have many opportunities to experience one of these unique experiences. Some of the opportunities are rewarded to season ticket holders drawn at random, and some are included in group packages. Give us a call at 918-632-7825 for more information! JP: Believe it or not, this idea has been discussed in recent years. A lot of you are probably thinking, “Outdoor hockey in Tulsa? No chance. 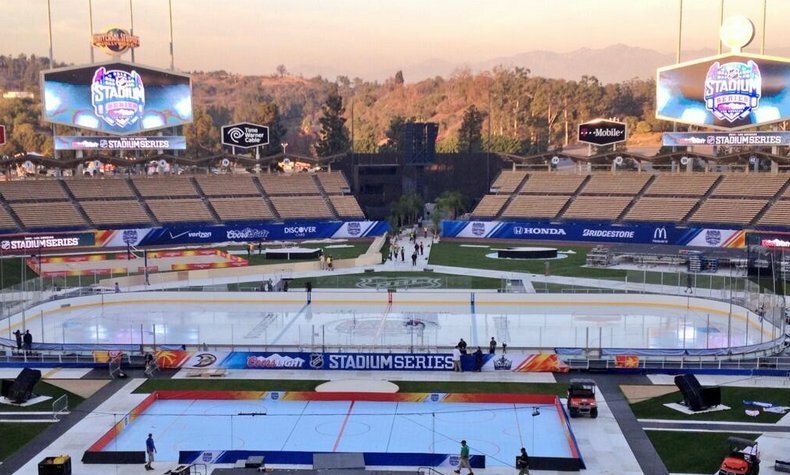 It’s too hot.” But as technology has advanced, we’ve seen teams pull it off in warm climates before (Picture below: Los Angeles Kings/Anaheim Ducks in 2014 at Dodger Stadium). The formality of pulling off an event like this is the tough part, including finding a suitable location and financial backing for it to be a big success. It could happen someday, but it won’t be this year. JP: I think the biggest change we’ve seen from the Oilers’ time in the old Central Hockey League (1992-2014) to the ECHL (2015-Present) is the relationship that continues to build from the ECHL’s dedication to working with the NHL and AHL. The ECHL prides itself in being a developmental league, and we’re seeing more and more success stories of players (641 to be exact) who start their careers in the ECHL and make it to the NHL. As we go along, many of the Oilers’ old CHL rivalries (Allen, Wichita, etc.) continue to develop and new rivalries are also formed. JP: While #OilyMcOilFace was both catchy and creative, likely would’ve gone viral, and was a huge hit in the front office, the “democratic process” consisted of a Fan Vote, where out of many great submissions, #DefendTheRig was the winner. Nominate #OilyMcOilFace again this year, and who knows? Tulsa Oilers Nation might embrace it! That’s it for this week. 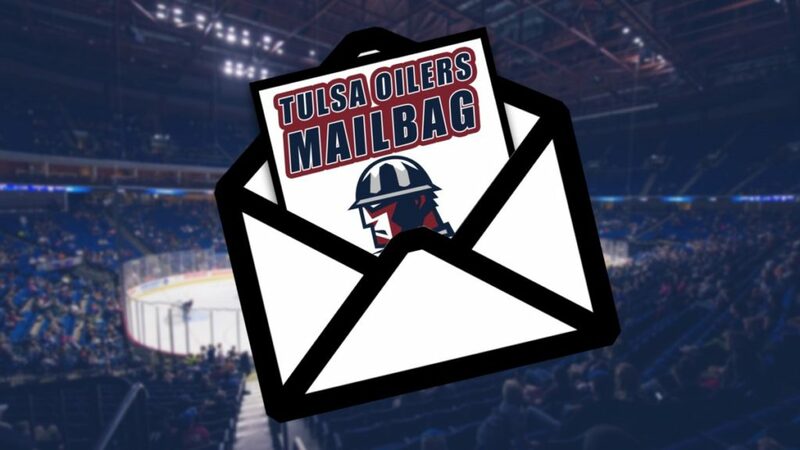 Thanks to everyone who submitted questions for our first-ever edition of the Tulsa Oilers Mailbag! Start sending your questions in for the next (July 31) edition, and I’ll do my best to answer them. If you haven’t had a chance to listen to our very first “Oil Filter” Podcast, you can listen to it HERE: Oil Filter Podcast. Our second episode will drop NEXT Tuesday (July 24). Make it a great week, and Go Oilers!